Robert Bamford and Lionel Martin founded 'Bamford & Martin Ltd' in 1912 to sell Singer cars from premises in Callow Street, London. They also serviced other vehicles and Lionel Martin built his one off special competition car there, basically a Coventry Simplex side-valve engine in a small 1908 Isotta Fraschini chassis. Lionel Martin was a competent competition driver regularly racing up Aston Hill, Aston Clinton, near Aylesbury in Buckinghamshire, England, and it was in reference to this hill climb that he called is car the Aston Martin. 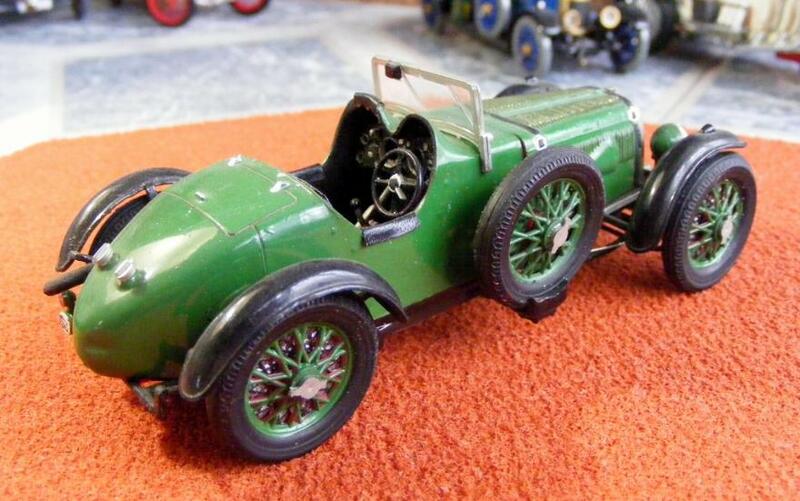 The pair decided to build replicas of Lionel Martin's hill climb car and within twelve months the company had built and registered its first car with the Aston Martin brand name. However, production was suspended because of the outbreak of World War I. Apparently all the machinery was taken over by Sopwith Aviation Company while Martin worked at the Admiralty and Bamford joined the Royal Army Service Corps. Production did commence post war as Bamford & Martin continued to build similar cars until a more refined design came online. By 1920 the company had relocated to premises in Henniker Mews, Kensington producing small quantities of a very refined and attractive (but expensive - £800) 1½ lt. side valve engine car capable of giving Bugatti a good run and frequently beating them in speed trials and hill climbs. Bamford had left the company that year but funding from Count Louis Zborowski helped rejuvenate the company. Aston Martin were already becoming a brand synonymous with high performance and elegance. The company took its first trip into international racing when it entered the 1922 French grand prix, two of it's cars completing the course too. The same cars went on to set world speed and endurance records at Brooklands. In due course racing would come to be not only important to Aston Martin but to define several of their models. But that time wasn't now and financially Bamford & Martin were not successful, in 1924 the firm was bankrupt and bought by one Lady Charnwood, who put her son John Benson on the board. He didn't do that well and in1925 the firm was forced into closure only to be rescued by a group of investors, under Renwick & Bertelli, and relaunched as “Aston Martin Motors Ltd.”, moved to the former Whitehead Aircraft Limited works in Feltham and would build cars to the specification of Augustus Bertelli, Lionel Martin having now left the company. Renwick & Bertelli had been working on a 16 valve twin cam 4cyl engine which they had intended to sell to vehicle manufacturers but they now saw the opportunity to use the reputation of Aston Martin to pursue sales of their motor. This situation did put the firm on a more stable financial footing and their cars continued to build a reputation for engineering and design quality which was backed up by good class performances in the Ulster TT, the Mille Miglia, Targa Abruzzo, Spa and Le Mans. Bertelli's car was actually several hundred pounds cheaper than the earlier Bamford & Martin car yet was altogether more advanced. The body panels were hand-formed aluminium over an ash wood frame and the four cylinder engine with dry sump lubrication was now capable of more than 80 h.p. at 5250 r.p.m. In this form it was entered for 1931 le Mans, coming 5th overall and first in class, and produced for the road as the “Le Mans model” from 1932. Sales of which were bolstered further by the Aston Martin team taking a clean sweep of podium places in their class at Le Mans in 1933. Between 1926 and 1937 Augustus Bertelli was designer and technical director of Aston Martin and the cars built in this period have become known as "Bertelli cars". 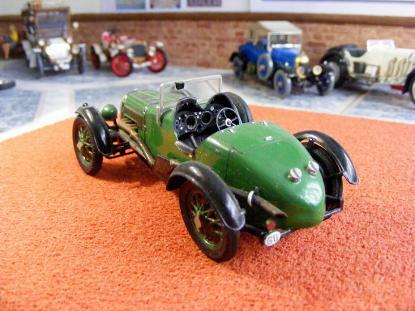 Such models include the 1½-litre "T-type", the "International", "Le Mans", "MKII" and its racing derivative, the "Ulster", as well as the 2-litre 15/98 racing derivative, the "Speed Model". Some 617 Aston Martin cars were produced between 1926 and 1940, the best pre-war year being 1937 when 140 cars were built. When financial problems started to occur again from 1922 L. Prideaux Brun rescued the firm and Aston Martin was forced to reconsider it's racing program, from 1936 onwards it focused solely on road cars. 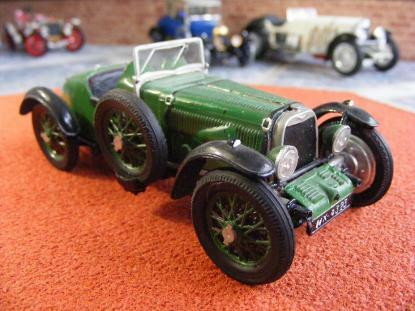 PYRO kit #C321 of the 1931 Le Mans Aston Martin was first released at the beginning of the 1960s. As a company Pyro had a particular skill for selecting model kit subjects for their historical significance more than popularity. Pyro's production and engineering quality was particularly good too in that the kits were straight forward to build and resulted in an accurate reproduction of the original. 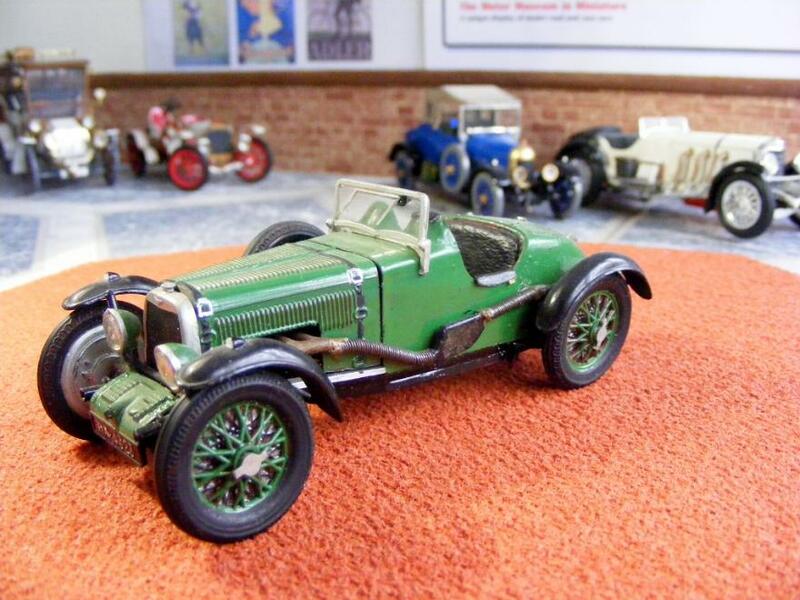 The kit designers at Pyro were able to use the actual car for the dimensions and details, at that time it was living at the Montagu Motor Museum, now known as the National Motor Museum, on the south coast of England. The kit features detailed chassis and interior, spoked wheels, and a removable bonnet to allow the builder to show of the detailed engine. During the 1970s the kit, from original Pyro moulds, was also released by Hales/LifeLike as product # C-7. 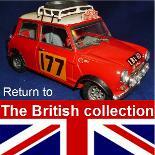 Today any mint boxing of this kit is very collectible, some fetching up to £70 for a mint condition kit. Built in the 1960s for a PYRO kit it was assembled with tube glue and painted with Humbrol enamels, applied by brush. It is built more or less straight from the box although it does have some additional trim made from leatherette and an added windscreen wiper motor.